NVIDIA seems to have finally acknowledged that some of its GeForce RTX 2080 Ti Founders Edition cards seem to have missed testing during QA and that could have been the reason for the increasing number of complaints about faulty cards causing all sorts of problems. Those affected can directly contact NVIDIA Support to get their issue resolved at the earliest. Several cases of faulty NVIDIA GeForce RTX 2080 Ti Founders Edition (FE) cards were recently reported and they seemed to cause problems such as system stability issues, BSODs, artifacts, and also dead cards in a few instances. Even as more and more reports of US$1,200 FE cards dying started to emerge, NVIDIA denied any major problem with the lineup. 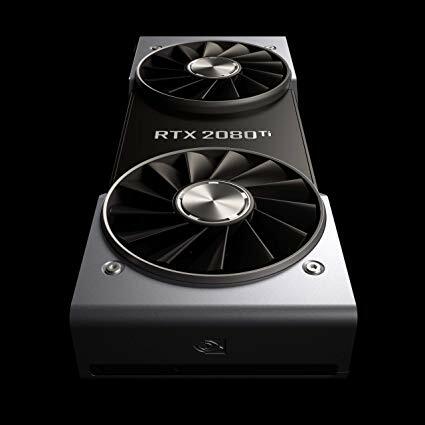 However, an NVIDIA rep has now posted on the GeForce forums that a few early early boards have managed to escape tests and anyone facing issues with the RTX 2080 Ti FE cards can contact NVIDIA Support for a resolution. Please visit www.nvidia.com/support to chat live with the NVIDIA tech support team (or to send us an email) and we’ll take care of it." The rep actually did not divulge details about the actual nature of the problem but did seem to admit that the 2080 Ti FE was at fault. AIB cards seem to be largely trouble-free save for a recent report on the [H]ardOCP forums about an EVGA 2080 Ti XC that caught fire while in use. The RTX 2080 Ti was hailed by reviewers for raw performance numbers but was also criticized for its poor price-performance ratio. The quantum of reports of faulty 2080 Ti FE cards appears to be lessening of late but if your precious has given up on you, we'd advise to contact NVIDIA Support at the earliest. Those on the verge of buying a new card can have a look at some of the AIB offerings or better still, wait till such issues are fully resolved.